Ask fellow campers about "Fletcher View Campground, Humboldt-Toiyabe NF" and nearby attractions. Great stay with 30 or 50 amp electrical hookups at your site, flush toilets and drinking water spigots here and there. We stayed in site #8 in 30' MH with a toad, which was an awesome site. Information on other sites: #1 first site in across from campground host, #2 double occupancy site, #3 short driveway, #4 nice site with views but close to bathrooms, #5 privacy trees/bushes and close tent pad for families with RV/Trailer and tent for the kids, #6 and #7 short driveways, #8 the best by far, #9 good site, #10 double occupancy site and #11 end of the road somewhat unlevel driveway. Half the sites are reservable and the others are first come first served. We stayed for 4 nights during a small snowstorm the last weekend in April 2018. Campground hosts Bob and Liz were great!!! We camped at Fletcher View Campground, Humboldt-Toiyabe NF in a Motorhome. Being early in the season we were the lone outfit besides the camp hosts. They were very friendly and helpful. The site we originally reserved was not user friendly in that we could not successfully back in a 40' rig due to trees across from the site. The camp hosts helped us change our reservation so we could have Site 1 which was much easier to back in. The downfall to the campground was the narrow one way loop at the end that you have to maneuver through to turn around and exit the CG. We were there 2 weeks and saw other smaller rigs come in with no apparent problem. The CG is at about 6500 feet and we did wake up one morning to 4" of snow. Host was out and plowed the road and shoveled a path to our door. We would stay here again only if we could get site #1. We camped at Fletcher View Campground, Humboldt-Toiyabe NF in a Fifth Wheel. North Las Vegas is the nearest shopping and is about a 30 minute drive once you get off the mountain. It is a high altitude site. If you are not used to the altitude it can be quite disconcerting. There are only 11 spaces. Get there early in the day to have a chance at a walk up site. Site manager is a very nice guy. He can be extremely helpful. Call ahead and find out if a site is there, he will tell you. He can't hold it, but he will tell you. We camped at Fletcher View Campground, Humboldt-Toiyabe NF in a Motorhome. Park was beautiful. The bathrooms could have used a cleaning but they were useable. Enjoyed the trail access. Each site also has a great tent pad. Will definitely go here again! Sites are spaced nearby to each other with some shade and tree cover. They are mainly asphalt and have a patio with a fire ring and picnic table. We camped at Fletcher View Campground, Humboldt-Toiyabe NF in a Motorhome. The best thing about this park is its location, with trees and mountains around. The amenities are sadly lacking. They advertise showers but both were out of order and when we reported this to a an employee of American Land and Leisure that runs the concession she said this was the first she had heard of it. The ashes are not cleared from the fire pits or the grills so there are piles of old ashes on the ground. There was broken glass on the concrete pad the table was set on. There were flush toilets which required several tries just to move paper. A once great campground that needs TLC. We camped at Fletcher View Campground, Humboldt-Toiyabe NF in a Tent. I gave this campground a 8 due to the close proximity to Las Vegas. It has tall Ponderosa Pines at the 7,000 ft level that represents a marked changed from the desert. Each site has power. This campground can be reserved by going to Recreation.Gov. The only water comes from community campground spigots. I suggest that you buy a rubber hose connection called a "water robber" at your local RV parts store as it allows you to temporarily attach your hoses to the non-threaded faucets found in most Forest Service campgrounds. You will be able to fill your fresh water tank. There is no Holding tank drop at the campground. I would not suggest that you reserve spaces 6 or 8 if you have a unit longer than 25 feet. Also note that the 2 million residents of the Las Vegas valley scramble to get into this campground with electric hookups, so you should book space way in advance. Overall a great experience We camped at Fletcher View Campground, Humboldt-Toiyabe NF in a Travel Trailer. A gem of a place, just 45 minutes from my home in Las Vegas, a great place to see all of the Mt. Charleston sights. Very friendly staff, firewood for sale on site. Electric, and water spigots, no sewer. Lots of space between sites. Of the 12 sites, six can be reserved. Took us two months to get a reservation. First come sites are tricky, according to host. Hard to predict, he says. Elevation is such that you might expect snow early as November. Bring everything you need. Nearest store is about 20 miles down the mountain. Rate reflects Senior Interagency Pass discount. We camped at Fletcher View Campground, Humboldt-Toiyabe NF in a Travel Trailer. This is a small campground about 30 miles from Las Vegas. It's about 20 degrees cooler than the Valley because it's in the mountains. We had site #2 which is a group site which is why the price was so high. The site was long, level and very wide, with 30/50 amp power receptacles. The hosts were so nice. This campground has only about 10-12 sites, so if you want to go on a weekend, I highly recommend reservations. We will definitely stay there again. 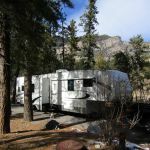 We camped at Fletcher View Campground, Humboldt-Toiyabe NF in a Fifth Wheel. This was our first travel trailer camping experience, new to RV'ing. The bathrooms were very clean, no showers though, water was available at a fill point. The camp hosts were very friendly and nice, paid $25 per night, all sites include 20a/50a power 3 different receptacles at the power box. The only negative was the fire pits were kind of tall and deep, so you get a smoky fire for lack of air, and the heat only hits your face. Add some big rocks to the pit to bring the wood up higher, that fixes that. The camp areas were very clean and lots of room on the paved camp area for your RV and chairs, etc., paved path to fire pit and picnic table, BBQ's are provided (briquette style). Wood is for sale at the hosts and 1 mile away is the Mount Charleston hotel with Starbucks, a restaurant and a bar, beers are $3 ea and extra bags of chips $1 (small bags). Not many other sundries so bring most of what you need. The campground is rather close to the main road, but it isn't a very busy road weekdays, especially at night. Weekends can be pretty busy in the summer at the campground. We have been local Las Vegans for 21 years, so we've seen all season up here. We didn't hear any traffic while sleeping. With a dry wash separating us from the road and some trees, we weren't too worried about the kids getting ran over, just keep a loose eye on them. Our are 3 and 4 years old. The campground was full, even though it was a weekday (summer), reservations are available for 8 of the sites and recommended, see website link for details. There are 2 double sites for slightly larger groups, 40 foot back in sites $25 for each night singles and $38 for double sites. The turn around is kind of tight for extra large Motorhomes, our F150 supercrew and 19 foot trailer had no problems getting in and out. We camped at Fletcher View Campground, Humboldt-Toiyabe NF in a Travel Trailer. Are you affiliated with Fletcher View Campground, Humboldt-Toiyabe NF ?